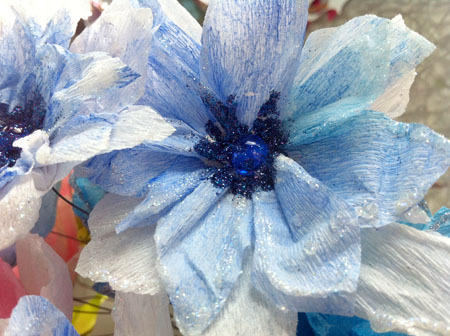 and got to work assembling the flowers. 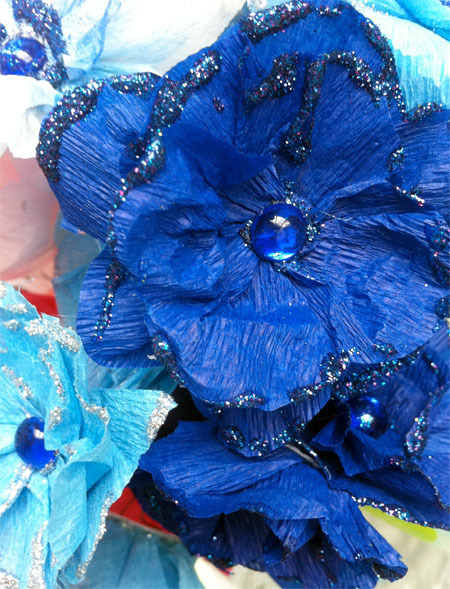 I’ve made these flowers before and did an in-depth tutorial here, in case you are interested in making your own. 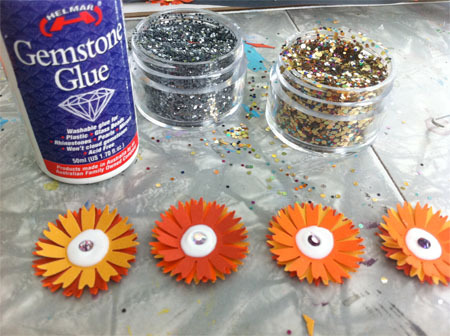 Instead of putting these flowers on pipe cleaners, I glued this grouping to simple 24 gauge wire. 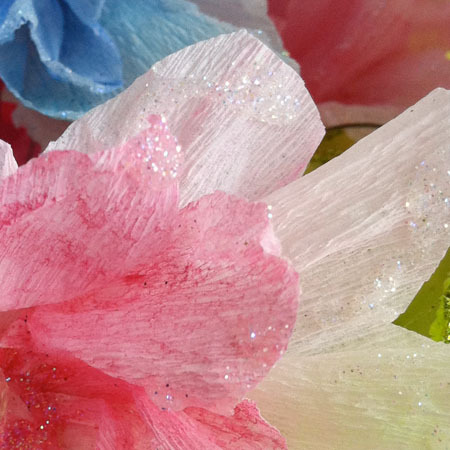 Of course 20 minutes in I decided that I needed a broader color palette, that I should watercolor some white crepe paper to get different shades of blue with an ombre color fade… then added pink and then… the whole project got away from me. It’s typical. I set out to make about 16 flowers and ended up making more like 30. 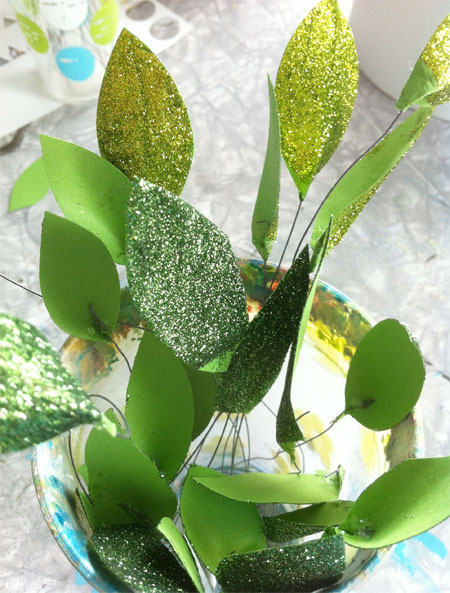 And tons and tons of little solid green glittered leaves… Aren’t they beautiful! 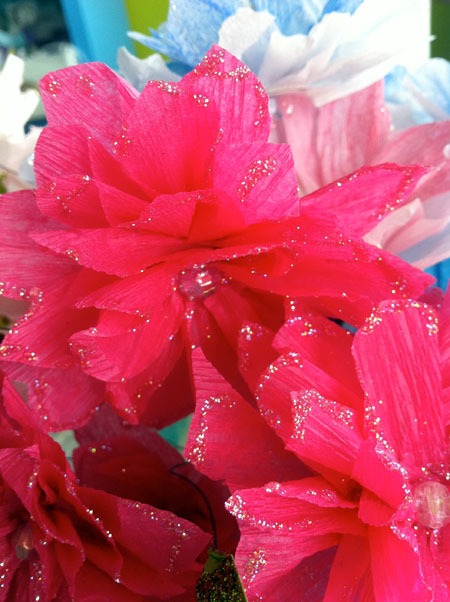 Close up of the watercolor pink color fade effect and the clear glitter. I’m sure I’ll find 101 uses for these flowers (Garland, swag, around a sign or frame, around a Chinese lantern, a wreath, a table centerpiece, Day of the Dead decor, gift wrap adornment etc etc), but for now, I’m going to enjoy them as a simple bouquet. 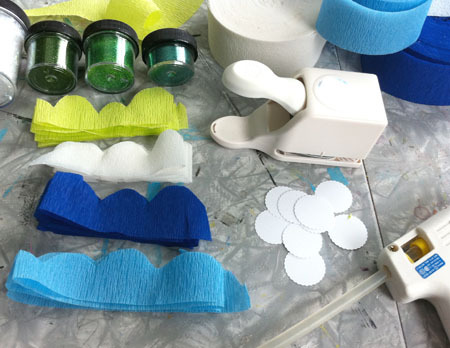 To glue everything together, I used Designer Dries Clear adhesive, which is my favorite glue ever! It has the perfect consistency. 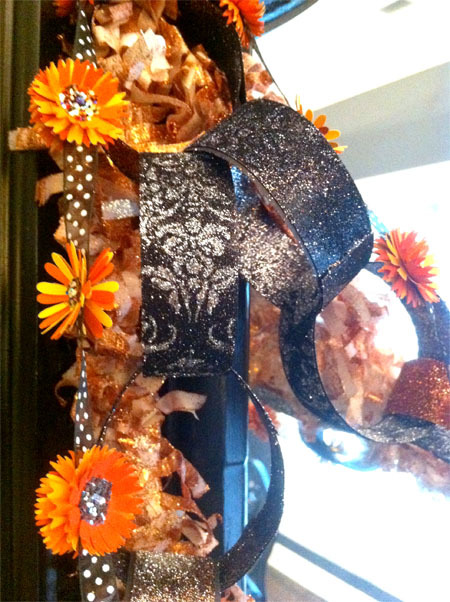 I love to layer garlands with different textures, shapes and materials. 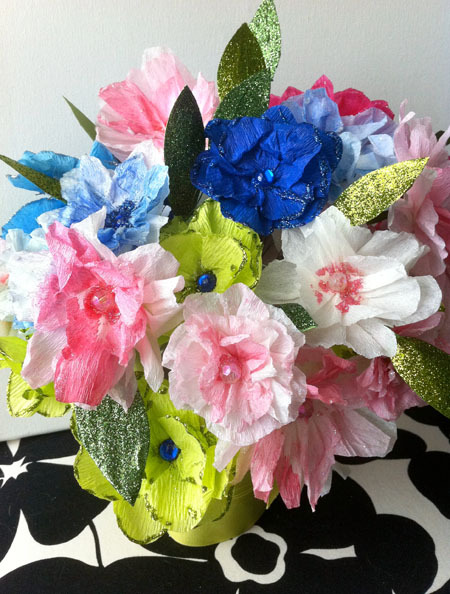 They are very versatile and you can mix and match themes to fit any occasion. 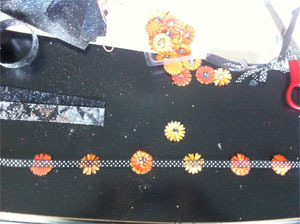 For this project trifecta, I wanted to make a fringey garland, a chain garland and a ribbon garland with flowers. First off… do this outside! 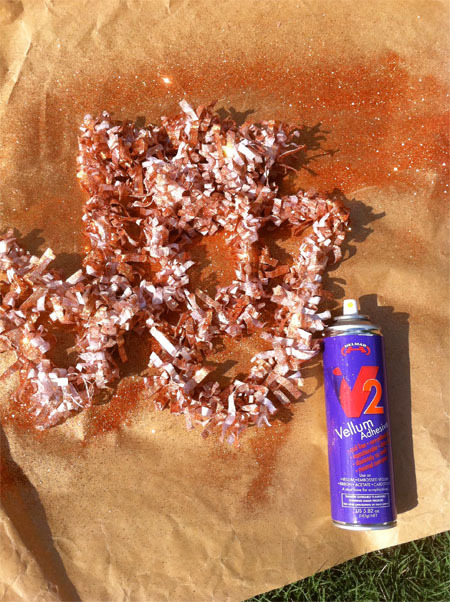 You are going to be using spray adhesive and making a mess. 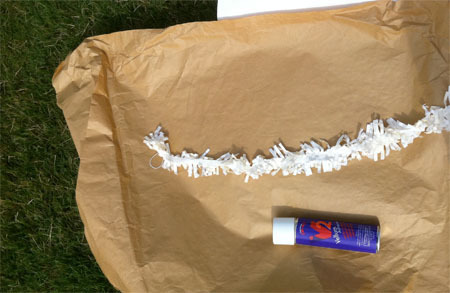 I started by spraying the paper fringe garland liberally with the Vellum Adhesive spray. 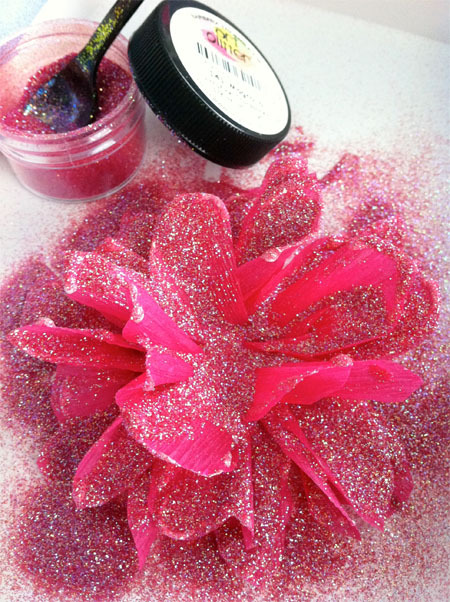 I then sprinkled the sprayed area with glitter and kept spraying, sprinkling glitter and rolled it around in the excess glitter. 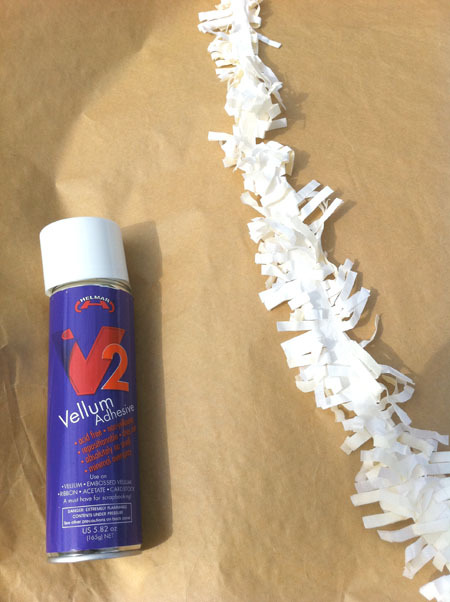 The Vellum spray was really neat because it made the white tissue garland paper turn more opaque and frosted, so the finished garland had a really neat vellum look to it. 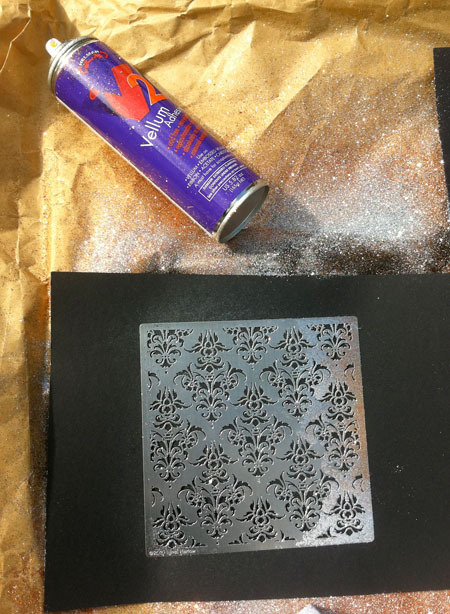 And quickly set a stencil on top of the sprayed area. 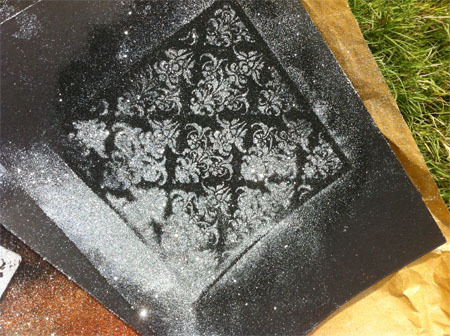 I then sprinkled the silver glitter carefully over the exposed area of the stencil. 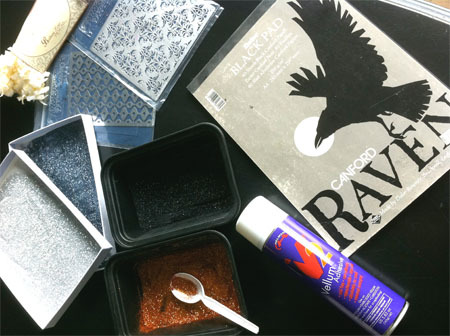 Then I carefully removed the stencil, tapped off the excess and covered the remaining exposed paper with black glitter. It wasn’t perfect, but it did give me enough of that Damask pattern to work with. 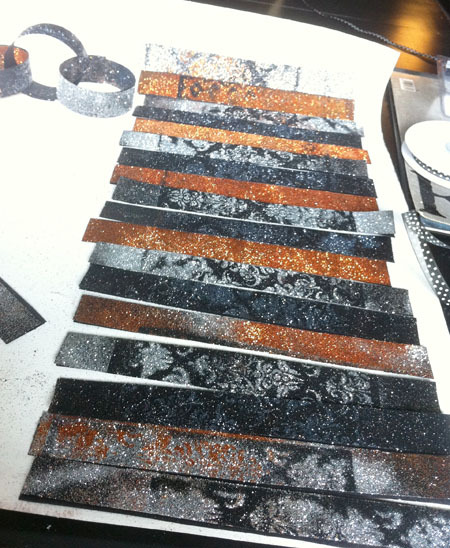 I did this with 3 more sheets of paper using all my glitter colors. 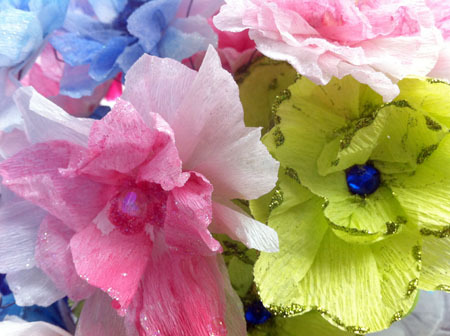 I left everything on my front porch to dry while I retreated into my office to start the flowers for the 3rd garland. Orange construction paper. 4 sheets in different shades of orange. 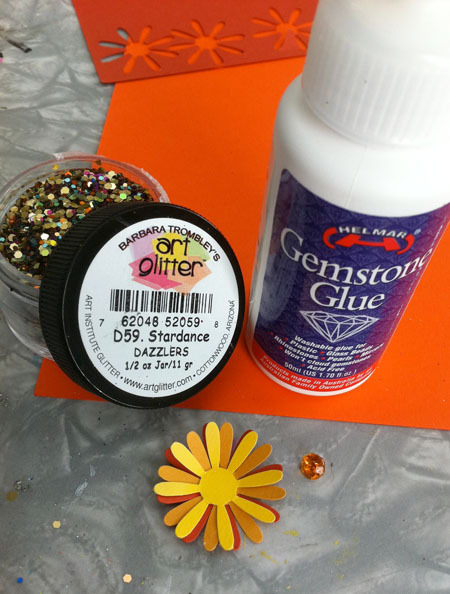 I put the flowers together, 3 petals deep and then used the Helmar Gemstone Glue to add the rhinestones and glitter on the inside of each flower. 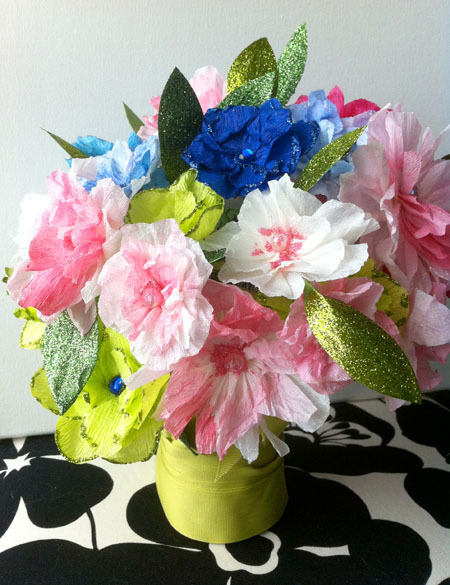 I made about 48 flowers total. 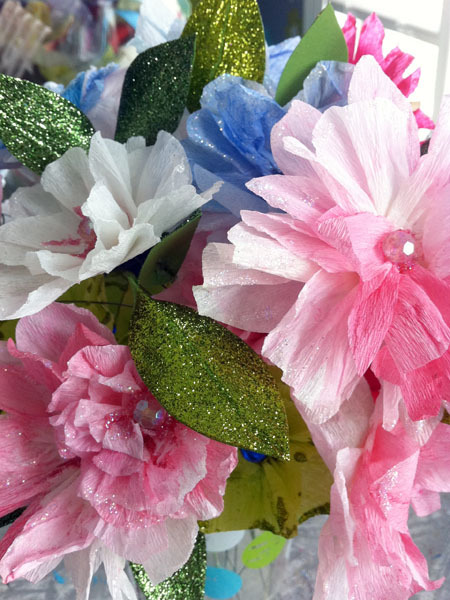 When the flowers dried, I glued them all back to back on the black and white polka dot ribbon using the Helmar 450 Quick Dry Adhesive. 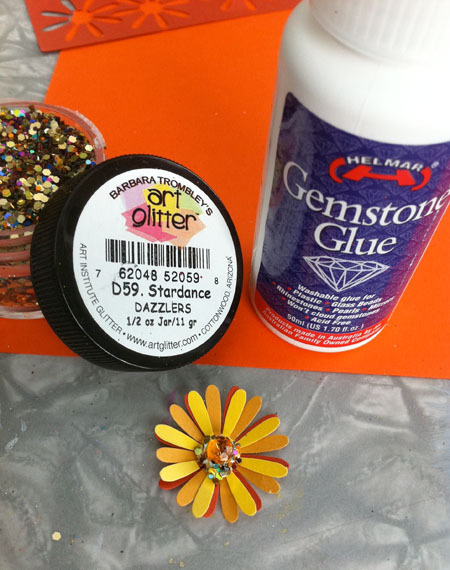 I love this glue because it has the consistency of rubber cement. 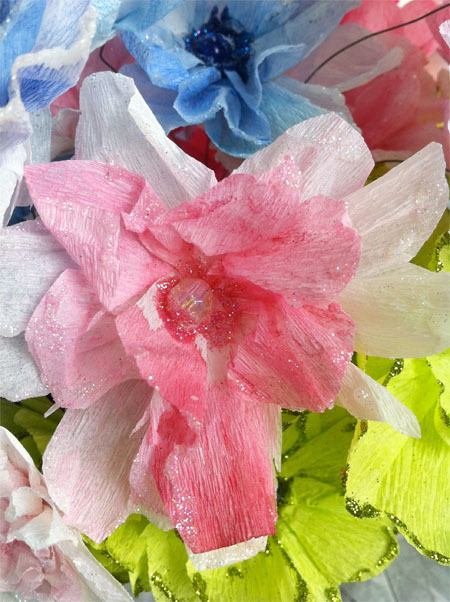 When making this garland, I wanted to space the flowers evenly and using this glue allowed me to move each flower before it dried. Also, the glue seeped just enough through the ribbon to help form a bond onto the other side of the ribbon. It was the perfect glue for this project. 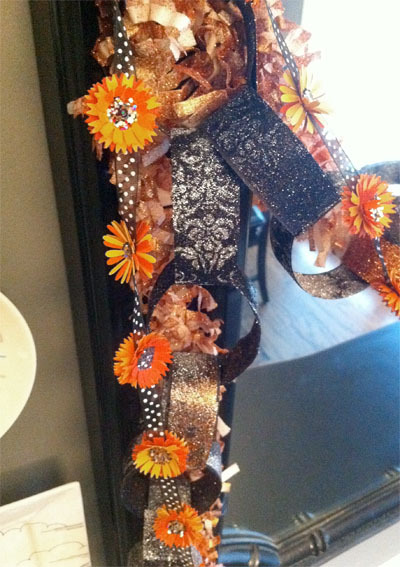 I set the flower garland aside to dry and went back to the paper chain project downstairs. 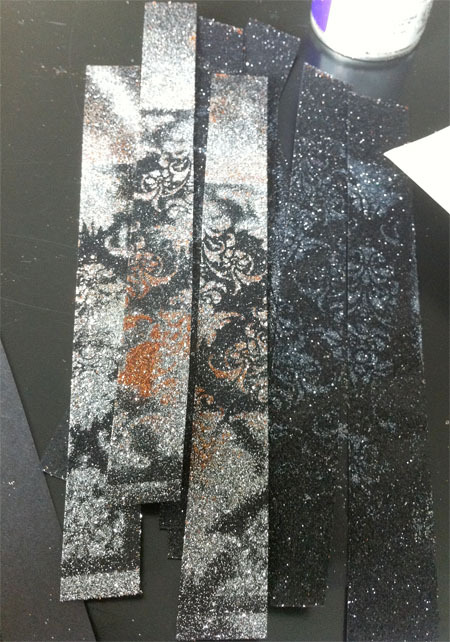 And then arranged the strips in alternating glitter colors… and glued them all together using the Helmar 450 Quick Dry Adhesive. 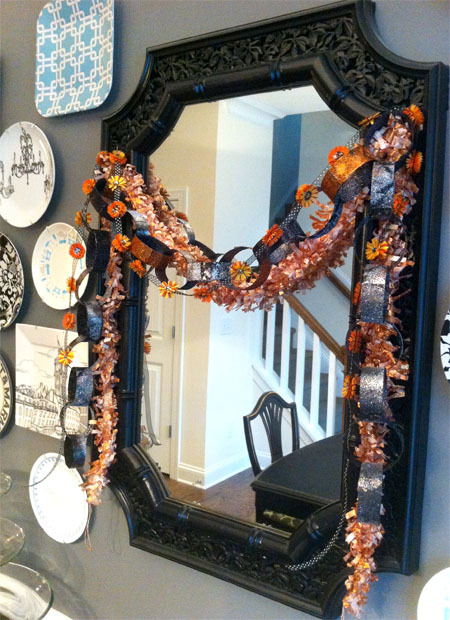 I have one more idea for a garland to add to this collection… another Halloween-themed garland with ghosts. 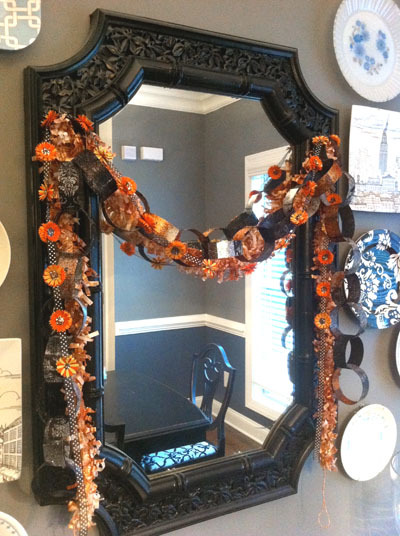 The cool thing is, once Halloween is over, I can remove the garlands that scream Halloween and leave the others up for Thanksgiving. Easy to make, easy to store and very versatile!